Iron Horse addon is a small addition that does not affect the complexity of the game. You just get a new improved horse that is several times superior to the usual one. The iron horse performs all the same tasks, but the horse is very tenacious and feeds on iron and gold. 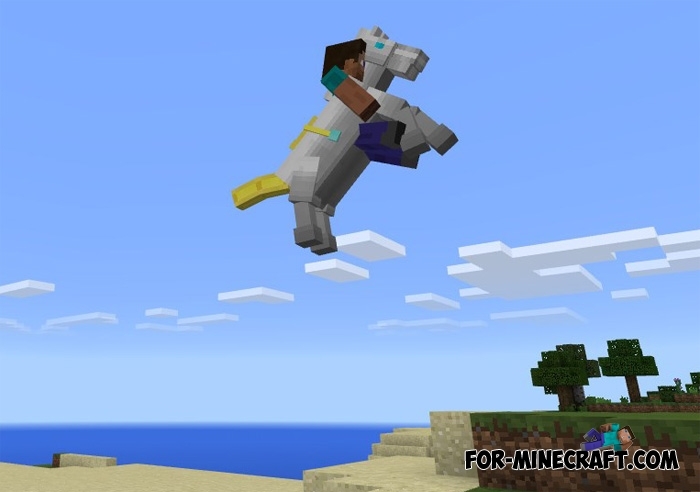 In truth, the Iron Horse addon is just a decoration for Minecraft PE, as the new horse does not know how to do anything special. The horse must be tamed so you can ride and also use a saddle where you can put items. The horse jumps very high and is great for mountainous areas. This companion can be taken on a long journey, instantly restore health and attack enemies. Perhaps this is the most harmless modification that will leave the game as it was. Star Wars companion addon for MCPE 1.0.0/1.0.2Currently there are no mods or texture packs for the latest version of MCPE in the style of the Star Wars..
Villager Companion Addon v2 for MCPE 0.17.0If you are tired of the dog as a friend and you want to get the character..